From the moment you enter 25 Runic St, you feel a sense of calm. This newly renovated Queenslander boasts a large levelled block in a prime position with plenty of breathing space for families at all stages of life. Situated on 845m2, walking distance to Rainworth Primary School, parks and local cafes, this property is in a prime position for families and investors alike. 25 Runic St flows over two levels, with four generously sized bedrooms downstairs and a luxurious master suite upstairs - allowing for many sleeping combinations for growing families. As you pass the white breeze block fence, the lush green lawn and enter the home through impressive double doors, you are welcomed by a sense of calm. The true north-east position, leafy aspect and abundant windows infuse the home with natural light and air-flow creating a relaxed and welcoming ambiance and a sanctuary from the busy demands of everyday life. Interiors are in fresh crisp white tones which complement a variety of furniture styles, textures, and hues. Polished timber floors, extra high ceilings, and VJ walls also add warmth and a traditional touch. The social hub of this home is the streamlined kitchen with eye-catching stainless steel bench tops, European appliances and floor to ceiling subway white tiles which flow through to your very own butler's pantry. This easy ambiance continues through full width folding glass doors onto the enormous undercover back deck and further into the grassy level backyard and swimming pool. Together these spaces will no doubt give the opportunity for memorable times spent with friends and family. 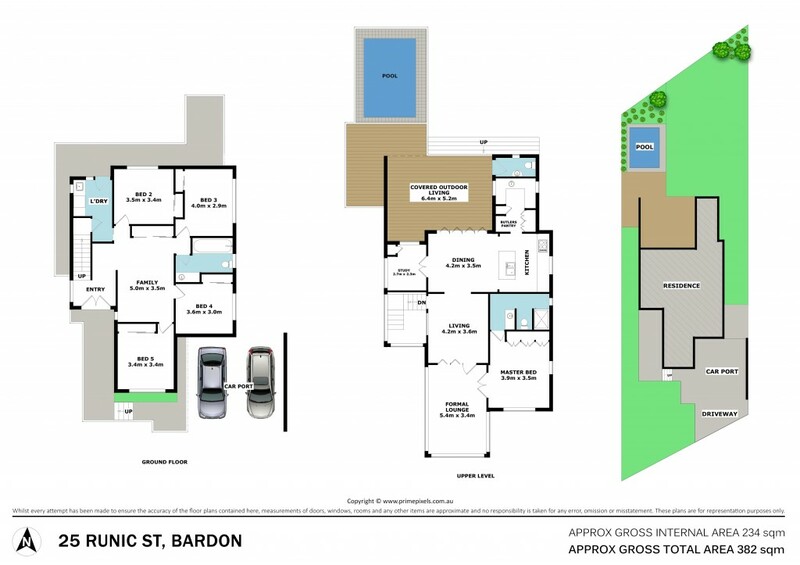 In a tightly held, leafy enclave on the doorstep of the city, vibrant new Bardon Market sought after cafe's and shopping precincts, reputable private and Rainworth State schools. 25 Runic Street offers you a fresh take on a family home and a lovely way to live. To appreciate please inspect or for more information please call Andrew Degn.